I have a cousin in New York whom I call on occasion, and at times when I call to speak to him his wife tells me he’s “out doing the Daf.” I’m a little embarrassed to ask her what that means, so could you possibly shed some light on this for me? Much appreciated. “The Daf” literally means “the page,” and is referring to a world-wide movement call the “Daf Yomi,” or “Page a Day” of the Talmud. A “page” in this case really means two pages, as a daf is both folios, or sides, of a page of Talmud. The Talmud, mainly a commentary to the Mishnah, is the main body of the Oral Law of the Torah. The Mishnah was redacted by Rabbi Yehuda the Prince in around the year 200 CE. Although the Oral Tradition was meant to be passed down by memory and not written, Rabbi Yehuda saw no choice but to commit it to writing due to Roman persecution forbidding the study of Torah and putting the entire tradition in jeopardy if not recorded for future generations. The Mishnah was divided into six Orders, or sections dealing with different areas of Jewish law. It was reviewed and ratified by all the leading scholars of his generation. The next three centuries were spent reviewing, analyzing and expounding on the Mishnah by the leading scholars of our people. In Jerusalem, in the fourth century CE, the first edition of Talmud appeared, called the Jerusalemite Talmud. It was written very concisely and in very pure Aramaic. Another hundred or so years of analysis were spent by the larger body of scholars in the Babylonian exile, leading to a far more vast and intricate edition of the Talmud, known as the Babylonian Talmud. It was redacted by two leading sages, Rav Ashi and after him Ravina, near the end of the fifth century CE. The Babylonian Talmud became the main subject of study in Jewish scholarly circles and yeshivot from then until today. The Talmud consists mainly of intricate and complex legal analysis, but also contains many sections of legal decisions as well as Aggadic discussions of Jewish philosophy, history and meaning. The Talmud has been described by historians as the “portable homeland of the Jews.” It provides unlimited intellectual stimulation, insight into the deeper side of Judaism and the pure joy and ecstasy of learning. In August 1923 a monumental step was taken forward in the study of Talmud among the Jewish people. The first “K’nessia Gedolah” or Great Assembly of the organization called Agudath Israel took place in Vienna with the presence of the leading sages of Israel and thousands of leading delegates. A great luminary, the legendary Rabbi Meir Shapira, made a suggestion at the plenary session to begin a worldwide movement called Daf Yomi, that Jews around the world would all study the same daf of Talmud. He claimed the best way to unify Jews around the world is that they would all be involved in the same area of Torah. A Jew from Pinsk visiting South America could find Jews to discuss the same page of Talmud he was learning. Jewish unity would be raised many levels. In addition, many remote areas of Talmud not usually studied except by the greatest scholars would become familiar to the rank-and-file Jew, raising the scholarship of the entire Jewish nation. Rabbi Shapira received a standing ovation by the 6,000 delegates for his idea, and Daf Yomi was born. Today tens of thousands of Jews study the Daf daily around the world, in classes, on the phone; classes even take place daily on the subways of New York. Here in Dallas, there are several groups which meet and study the daily Daf together at various times of the day. Every 7-1/2 years a great worldwide celebration takes place upon the completion of the entire Talmud by klal Yisrael, having studied all its 2,947 folios or 5,894 pages. This is the holy brotherhood your cousin is a member of — you should be very proud of him! In preparation for, and in celebration of, Tu B’Shevat, classes at Torah Day School of Dallas learned about, discovered, experimented with and appreciated the wonders of trees. Family trees, paper, oxygen, fruits and beauty helped all students connect and marvel at all that Hashem gives us with the gift of trees. 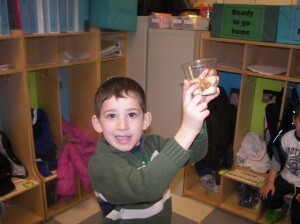 Planting seeds and experimenting with peels and seeds of different fruits were highlights of the week. Children at TDSD went into Tu B’Shevat very knowledgeable about the gifts of the trees and truly appreciated the shivat haminim (seven special foods of eretz Yisrael) that they ate on Tu B’Shevat. The fabric of Dallas’ community is woven of many wonderful threads, and one of the most vibrant is the entrepreneurial spirit and vision of the city’s Jewish citizens. For 100 years, the Jewish Federation has supported the Dallas community through a wide variety of agencies which preserve and enhance Jewish and non-Jewish life locally, nationally and globally. At the same time, our city’s Jewish community has contributed countless visionaries who have helped to make Dallas world-renowned. The Federation proudly honors 100 years of its service and achievements at Imagine, the Centennial Gala, Saturday evening, Feb. 12. Centennial sponsorships, which have already exceeded the original goal of $1.2 million, are devoted to a yearlong series of programs and events beginning with a celebratory gala and culminating with a community-wide event in November. The impressive list of generous corporate and family sponsors includes many of our city’s most noted philanthropists, many of whom are descendents of the first Jewish families to settle in Texas over 150 years ago. In fact, the Centennial’s title sponsor, Commercial Metals Company, was co-founded by the late Jacob Feldman, one of Dallas’ first major Jewish philanthropists, for whom the Federation’s building is named. Commercial Metals Company donated $100,000 as the title corporate sponsor. Other corporate sponsors, as of press time, are as follows: $50,000: Alon USA, Bank of America Merrill Lynch/Merrill Lynch Wealth Management/U.S. Trust, and Neiman Marcus; $25,000 to $30,000: American Airlines Group and Meeting Travel, Crow Holdings, The Glazer Family of Glazer Distributors, Kahn Mechanical Contractors, JPMorgan Chase Bank, Texas Health Presbyterian Dallas and Plano, the Texas Jewish Post, and Waldman Bros.; $10,000 to $20,000: AT&T, Dallas Morning News, Deloitte, Dittmar Design, Inc., Ernst & Young LLP, Friedman & Fieger, Gardere Wynne Sewell LLP, Kahn Mechanical Contractors, KPMG LLP, Lidji Dorey & Hooper, Park Place Dealerships, Prescott Pailet Benefits, PriceWaterhouseCoopers LLP, Ryan and Company, Texas Capital Bank, The Weitzman Group & Cencor Realty Services, Wells Fargo, William Noble Rare Jewels. Family sponsors are as follows: $25,000: Carol and Steve Aaron, Janet and Jeff Beck, Cynthia and Robert L. Feldman, Elaine and Trevor Pearlman, Barbara and Stan Rabin, Karen and David Weinreb; $10,000 to $18,000: Anonymous, Candy and Ike Brown, Joe and Byrna Funk Philanthropic Fund, Lisa and David Genecov, Debbie and Eric Green, Candace and Robert B. Haas Family Philanthropic Fund, Ynette and Jim Hogue, Karen and Alan Katz, Stacey and Donald Kivowitz/Cathy and Craig Glick, Ann and Nate Levine, Mankoff Family Foundation, Eugene McDermott Foundation, Jill and Jeffrey Rasansky Philanthropic Fund, Beverly and Cary Rossel, Leslie and Howard Schultz Family Foundation, Barbara and Sheldon Stein Philanthropic Fund, Sandra and David Veeder, Abe Zale Foundation. Carol Aaron, who is chairing the gala, is also a past chairman of the Federation board of directors. “Chairing this celebration, for me, has been simply a labor of love,” she remarked. “To share the celebration of a century of Jewish life in Dallas with the entire community, and in such a magnificent way, is truly an honor and a privilege.” The gala is expected to draw a sell-out crowd of 1,200 people. This once-in-a-lifetime event will include the premiere of a professionally produced documentary film about the history of the Federation and a touring, museum-quality historical exhibit portraying the significant role of the Jewish community in the development and advancement of the city of Dallas. For more information, please visit www.jewishdallas.org. A grief support group being sponsored by Jewish Family Service will be held at Congregation Shearith Israel, 9401 Douglas Ave., Dallas. The group will meet on consecutive Wednesdays from noon to 1:30 pm, Feb. 2 through March 9. These sessions will be facilitated by JFS counselor, Deborah Leibensberger, ACSW, LCSW. They are open to the Jewish community, but participants need to register in advance by contacting Deborah Leibensberger at Jewish Family Service, 972-437-9950. Friday, Feb. 4, is Wear Red Day at the J. Try out a class. From 9 to 10 a.m. in the Mind/Body Studio, there will be a session on Pilates Barre Blend. This ballet-inspired hybrid class blends Pilates mat, modern dance conditioning exercises and core work, resulting in a total body reshaping experience to burn fat and develop lean and long muscles. Free on that day only, Preschool Open Gym from 9:30 to 11 a.m. Play in the gym with your child. Your child can practice gymnastics skills, roll, climb and tumble! Walk-ins and playgroups welcome; ages 6 and under, in the Gymnastics Room. At 10 a.m. in the Board Room, nutritionist Dana Roseman, MPH, RD/LD, will speak on “Eating for a Healthy Heart,” a practical guide for keeping your heart healthy with good nutrition. Learn what to include on your plate to maximize your cardiovascular health and to achieve your health goals in 2011. Two sessions of cardio tennis will be available at the Joe and Byrna Funk Good Time Tennis Courts at the Ron Zahler Tennis Center: 11–11:30 a.m. and 11:30–noon. Each will be a 30-minute free clinic. If you want the opportunity to get a great workout by hitting some tennis balls, sharpen your tennis skills and have a fun and extreme cardio workout. From noon to 1 p.m., there will be circuit training with personal trainers in the Fitness Center. The J will be turning up the music and setting up stations for a one-hour nonstop workout. Trainers will be on hand to lead participants through a variety of exercise stations. From 1 to 1:30 is an Adult Cardio-Fit Gymnastics Class, a fun and unique alternative to your regular exercise routine. This class provides a challenging workout to adults by utilizing the gymnastics equipment to provide a full-body workout. It will focus on four areas: flexibility, strengthening, cardio and very basic gymnastics. No prior gymnastics experience is needed. Come experience the fun your kids have in the gym! Limit of eight participants. Guarantee a spot by e-mailing apostel@jccdallas.org to reserve in advance. Not a member? Contact Carrie Ann Ring for a free guest pass for the day; call 214-239-7138 or e-mail caring@jccdallas.org (valid ID required). The Aaron Family JCC is located at 7900 Northaven Road in Dallas. Congregation Nishmat Am introduces “Teen Topics,” a new program for ages 12 through 15-plus. One Shabbat morning a month, Nishmat Am will have a teen service from 10:30 to 11:30 a.m. The service will be a combination of tefillah (prayer) and discussion on a current topic. The program will debut on Feb. 5, Parashat Terumah, with the discussion topic, “Is Technology Handicapping or Improving Your Social Skills?” For this inaugural session, all teens who join the service are also invited to be Nishmat Am’s guests at “The Rabbi’s Tish.” For more information, please contact Stanley Siegel at the synagogue office, 972-618-2200. “The Rabbi’s Tish” (“at the rabbi’s table”) consists of a post-Kiddush deli lunch, study, spirited singing and oneg Shabbat — the delight of the Shabbat. Study text will be Pirkei Avot, the Ethics of the Fathers. Cost, by prepaid reservation with payment, is $15 per person (children ages 3–10, $7.50; children under age 3, free). Children’s supervision is available with reservation. To reserve your place and make your payment, please e-mail info@nishmatam.org or call 972-618-2200. Congregation Nishmat Am is located at 2113 W. Spring Creek Pkwy. in Plano. The Baker Idea Institute offers several opportunities to learn and discuss the related topics with medical, mental-health and theater professionals. These programs are intended for both teens and adults interested in more in-depth conversation and education on these issues. “hard 2 spel dad”: Friday, Feb. 4, 7:30 p.m.; Saturday, Feb. 5, 1:30 p.m.; Sunday, Feb. 6, 4:30 p.m.; Saturday, Feb. 12, 7:30 p.m.; Sunday, Feb. 13, 1:30 p.m.; Saturday, Feb. 19, 4:30 p.m.; Sunday, Feb. 20, 4:30 p.m.
“dont u luv me?”: Saturday, Feb. 5, 4:30 and 7:30 p.m.; Sunday, Feb. 6, 1:30 p.m.; Thursday, Feb. 10, 7:30 p.m.; Saturday, Feb. 12, 1:30 p.m.; Sunday, Feb. 13, 4:30 p.m.; Friday, Feb. 18, 7:30 p.m.; Saturday, Feb. 19, 1:30 p.m.; Sunday, Feb. 20, 1:30 p.m.
“EAT (It’s Not About Food)”: Friday, Feb. 11, 7:30 p.m.; Saturday, Feb. 19, 7:30 p.m.
“The Secret Life of Girls”: Saturday, Feb. 12, 4:30 p.m.; Wednesday, Feb. 16, 7:30 p.m.; Thursday, Feb. 17, 7:30 p.m.; Sunday, Feb. 20, 7:30 p.m.
“Road to Resilience” Clinical Path: Session I: Friday, Feb. 11, 7 p.m.; Session II: Saturday, Feb. 12, 9:30 a.m.–12:45 p.m.; Session III: Saturday, Feb. 12, 1–9 p.m.
“Road to Resilience” Creative Path: Session I: Friday, Feb. 18, 7 p.m.; Session II: Saturday, Feb. 19, 9:30 a.m. –12:45 p.m.; Session III: Saturday, Feb. 19, 1–9 p.m.
Prices: Full Festival Pass (entrance to all events), $75; Festival Performance Pass (entrance to all performances), $45; “hard 2 spel dad” and “dont u luv me?” $12–$23; “EAT (It’s Not About Food)” and “The Secret Life of Girls,” $10; BII Road to Resilience Symposium, $75 per weekend/$25 per session. For more information, please contact Nancy Schaeffer at DCT or the DCT box office, 214-740-0051, www.dct.org; or the Baker Idea Institute, 214-978-0110, www.bakeridea.org. Congregation Beth Shalom in Arlington held its annual meeting on Wednesday, Dec. 29, and the sanctuary was filled with members whose interest was piqued by the e-mail subject line of “good news to share.” The meeting was emotionally charged by passionate pleas for members to get involved and participate, and when the incomplete slate of officers was announced and people were challenged, it didn’t take long for members to volunteer to fill those vacant positions. The good news that was shared was that the synagogue’s mortgage was paid off in full and there will no longer be mortgage payments to make, which is a great boon to the budget! When Past President Barry Schneider saw the vision several years ago to be “Free in Three,” he might not have realized that it would take a couple of years longer than that, but certainly he and the following president, Stuart Snow, saw the rainbow on the horizon. Now under the leadership of President Barry Goldfarb, that dream was realized. Another highlight of the evening was the presentation of the Congregant of the Year award that was given to well-deserving Randy San Antonio. A lovely reception was held in Randy’s honor in the social hall following the meeting. Also acknowledged was Janet Aaronson, who after nearly 23 years of service has retired from her position of executive director. Linda Seward, who is now the administrative assistant, was introduced to the congregation. A special thank-you to Lynda Friedensohn for preparing a fabulous dinner prior to the meeting and to all who assisted her. The Lil Goldman Early Learning Center celebrated Tu B’Shevat with cake and an educational presentation from the North Central Texas Council of Governments (NCTCOG). Lil Goldman’s been going green with recycling efforts for a few years, and the presenters from NCTCOG gave a wonderful, kid-friendly presentation on how to keep the air clean. Each preschooler went home with information about clean air and conservation, packed in a reusable lunch tote, courtesy of the NCTCOG. The presentation supplements the fundraising efforts by each classroom for the Jewish National Fund, turning pennies and change into trees to help reforest Mt. Carmel. JWI, Jewish Women International, will host Dave Lieber, the watchdog investigative journalist for the Fort Worth Star-Telegram, on Wednesday, Feb. 2, at 10:15 a.m. at Beth-El Congregation, 4900 Briarhaven Road, Fort Worth. The subject is how seniors can avoid scamming. So how can we connect both to our Jewish roots and our natural roots? Step 1 is to make a commitment to get outdoors! In our world of exercise, we are going to gyms instead of going outside — so take a hike or just a walk in the neighborhood with your children. The story of Moses and the burning bush is one known to most — we assume that, of course, he would stop to look at such a wondrous sight. Today we would probably be too busy to notice — and we would be talking on our cell phones or looking at an e-mail on the run. Step 2 is to stop and take notice. Each morning traditional Jews say a series of prayers called “Birchot Hashahar.” One of these blessings can be used as we explore the world: “Baruch atah, Adonai Eloheinu, Melech haolam, pokei’ah ivrim. Blessed are You, Adonai, our G-d, Ruler of the universe, who gives sight to the blind.” Fortunately, few of us are truly blind, yet this blessing is recited daily to remind us not to become blind to the world. A fun activity is to take a blind hike with a partner — Partner A guides Partner B (who closes their eyes) to search for a site of beauty or interest. When A discovers a wonderful spot, they should adjust B’s head so their eyes will open on the selected view — just like taking a photo with a human camera. When you both look at the wondrous sight, say the blessing and think about the beauty of nature plus the wonder of discovery. Mark Kreditor, whose journeys through the American Jewish Songbook have delighted Dallas audiences for a decade, will debut a new show at a special Sunday morning brunch at Congregation Beth Torah on Jan. 23. For the annual Intrafaith Brunch sponsored by sisterhoods of Dallas-area synagogues, Mark has compiled a medley of theater music made famous by Jewish women. The Intrafaith Brunch offers women from every synagogue the chance to get together in a setting comfortable for everyone. The catered kosher meal will be supervised by an on-site mashgiach. Like all of his shows, Mark’s new presentation features him at the piano, playing, lecturing, singing and conducting sing-alongs in his ebullient, edifying style. Tickets are $18. For more information, call Jo Zeffren at 972-239-7643, or Congregation Beth Torah at 972-234-1542. Beth Torah is located at 720 West Lookout Drive in Richardson. Kids K–6: Don’t be bored at home when there’s no school! Kids in kindergarten through sixth grade, get to the J on Monday, Jan. 17, for the National MLK Day of Service. Dr. Martin Luther King Jr. once said, “Life’s most persistent and urgent question is: ‘What are you doing for others?’” Join in this day of service for fun projects that also give back. Be sure to mark your calendars and sign up for Super Hero Day, Monday, Feb. 21, President’s Day, from 9 a.m. to 4 p.m. Don’t be bored at home; go to the J for a break day full of Super Hero fun. Decorate your super hero cape, show off your super powers, participate in a super hero training camp and decorate cookies to look like your favorite super hero. $40 for J members, $50 for non-members. Before and after care available; space limited so please register in advance. All children should bring a kosher sack lunch, swimsuit and towel (enjoy swimming in the J’s heated indoor pool). For more information, contact Abbii Cook, youth director, at 214-239-7189 or acook@jccdallas.org. Akiba Academy of Dallas and Yavneh Academy, both housed at the Schultz Rosenberg Campus, announced the appointment of Janis Gail as their new director of development and Francisco Milian as director of marketing. These announcements follow the recent formation of Schultz Rosenberg Campus’ Shared Services, the first entity of its type in the nation among Jewish day schools. Shared Services will provide fundraising, marketing, recruiting, finance and administrative support to Akiba and Yavneh. Both schools are nonprofit entities. Janis Gail, an El Paso native and University of Texas at Austin graduate, spent 10 years living and working in Washington, D.C., before returning to her home state and settling in Dallas. With previous managing positions at the Jewish Federation, Community Homes for Adults, Inc. (CHAI) and most recently Legacy Senior Communities, she brings extensive experience serving Dallas’ Jewish population. Her addition as director of development is expected to significantly advance the schools’ fundraising efforts. Francisco Milian, Shared Services’ director of marketing, has over 14 years of marketing communications experience and has managed the business of several blue-chip brands including Unilever, Kimberly-Clark, Macy’s, JCPenney and Infiniti automobiles. Most recently, he served as American Airlines’ associate media director at TM Advertising in Dallas, where he helped American expand its media footprint across the globe, including key emerging markets (Brazil, China, Russia and India). Jo Chung believes that these new hires will translate into further benefits for the students. ­“Akiba and Yavneh can expect that the additional funding we will aim to capture through our marketing, enrollment and fundraising efforts will positively impact the already substantial breadth of services and activities we provide our students and the broader Jewish community,” he commented. NCSY Jewish Youth Leadership, the international youth movement of the Orthodox Union, will honor Rabbi Michael Rovinsky of St. Louis, Mo., as an inductee into the Ben Zakkai Honor Society (BZHS) at its annual Scholarship Reception Sunday, Jan. 30, in New York. Rabbi Rovinsky is the son of Shirley and Ervin Rovinsky of Dallas. At the reception, the OU will also pay tribute to the remarkable legacy of the late Dr. Bernard Lander, the founder and, for 40 years, president of Touro College. Dr. Lander died on Feb. 8, 2010 at the age of 94. Upon his return to the United States in 1982, he helped initiate Kol Yaakov Yeshiva in Monsey, N.Y., before learning at Ner Yisrael in Baltimore, where he earned a master’s in Talmudic law and an MBA from Johns Hopkins University. In 1984 he happily welcomed his next milestone, marrying Selina Epstein of Phoenix, a fellow NCSY aficionado. He became assistant director of NCSY Goes to Yeshiva, the forerunner of Camp Sport, developing the program for a full decade; all the while he continued to advance his own Torah learning in the Ner Israel Kollel until 1990. His career in Torah education continued in Dallas as Judaic studies principal and rebbe at Akiba Academy until 1993, when he moved to St. Louis to assume the executive director position at the Epstein Hebrew Academy. In 2002, the baalei batim asked him to fill in when the St. Louis NCSY director resigned. Realizing how much he missed working directly with youth, he grabbed the chance. Nine spiritually lucrative years later, the city boasts dynamic programs and events, including the Jewish Culture Club, now under the umbrella of the Jewish Student Union. A firm believer that Junior NCSY is critical to the success of Senior NCSY, Rovinsky, in 2005, started Camp Gesher, the first NCSY summer camp for juniors; the following year, with the vision and support of Midwest Regional Director Rabbi Micah Greenland, he started Camp Nageela Midwest in partnership between Agudah Midwest and Midwest NCSY. “I’ve always wanted to give back what NCSY has given me,” he says. “NCSY gave me the strength to persevere when I was becoming frum, when I started wearing a yarmulke in public school and had to fight for the right to do so.” He finds it deeply gratifying to watch the students from his first year at Junior NCSY coming back from seminary and getting married. Suffice it to say, a lot of NCSYers unabashedly celebrating their Judaism are sure glad Rabbi Rovinsky didn’t become Rovinsky, Attorney at Law. A key part of the reception will be the honoring of the memory of Dr. Lander. “Dr. Bernard Lander’s historic role in helping to create and nurture NCSY ensured him a special place in contemporary American history even before he set out to revolutionize higher education by founding Touro College,” declared Dr. David Luchins, chairman of the Political Science Department of Touro College, who, with his wife, Vivian, has been an NCSYer since 1961. For information on attending the BZHS annual Scholarship Reception or to contribute to its souvenir journal, visit www.ou.org/bzdinner or contact Elaine Grossman at 212-613-8350 or grossman@ou.org. Adults and kids, come bowl to help MS research! The 2011 Gladiator’s Multiple Sclerosis Walk Team “Bowling Bash” Fundraiser will take place Sunday, Jan. 30, from 2 to 4 p.m. at the AMF Richardson Lanes, 2101 N. Central Expwy. (north of Campbell Road). Proceeds benefit the Multiple Sclerosis Society, so you can have fun and friendship while contributing to help find a cure. Cost is $20 per adult, $12.50 for children 12 and under for two hours of bowling and shoe rental. There is no charge for children age 5 and younger; they can bowl with a paid adult. This will be a family-friendly event with bumper lanes available for the little ones. Individuals or teams up to five members are encouraged. Please RSVP if attending, with names of your teammates and any questions. Lane assignments will be made in advance. There’s no football game conflict, so come bowl with family and friends for a great cause. A minimum of 60 bowlers are needed to make this a successful fundraiser. Please reply to Larry Krasner at larrynleslie@yahoo.com, 972-931-8048 home or 214-648-2422 work. The Sylvia Gray Chaverim is proud to have as their next speaker, Gil Elan, the executive director of the Southwest Jewish Congress. A retired lieutenant colonel in the Israel Defense Forces, he is a widely regarded expert on Israel and the Middle East. Educated in London and Tel Aviv, Gil Elan has been interviewed on numerous radio and TV shows. He will speak to the group on current events in Israel. The lecture will take place on Sunday, Jan. 16, at 12:30 p.m., at Congregation Beth Shalom, 1211 Thannisch Drive in Arlington. Donation is $5; the event is catered by Boston Market. Please RSVP to either Rosalie Cagan, 817-684-7197, ccagan@tx.rr.com, or Sandy Silverman, 817-741-0240, silvermansandy@yahoo.com. This program is partially funded by a grant from the Jewish Federation of Fort Worth and Tarrant County. Ahavath Sholom will hold an Open House on Jan. 23 and invites the community to join in celebrating Tu B’Shevat. There will be presentations by the students, a seder and a camp presentation by Camp Young Judaea. Learn about the shul’s school, congregation and programs. As you probably know, fire recently burned the forests of northern Israel, but this Tu B’Shevat we can help rebuild them. Join the students of Ahavath Sholom in buying new trees to rebuild the forests of Israel and get an organic T-shirt and certificate to commemorate your contribution. There are five styles of shirts to choose from, including: “I planted a tree in Israel,” “G-d Loves Green,” “As my fathers planted for me, so I will plant for my children.” To participate in either the Open House or the “Trees and Tees” order, please contact Naomi Brand at naomi.brand@ahavathsholom.org or 817-731-4721. Orders must be submitted by Jan. 16. There’s a new group in town! Ahavath Sholom invites the ladies of our community to join them to celebrate Rosh Chodesh. They know you are busy, but most likely you will eat during the day, so why not join in once a month not only to celebrate Rosh Chodesh, but to get to know your Jewish friends and neighbors. Bring your business cards if you want to share them also. The group started Jan. 6 at Rockfish in Fort Worth with a wonderful hour of visiting and learning. A few stayed a little longer because the company was so nice and they didn’t want it to end. Each month the group will meet at different locations. All they ask is that if they eat out, you order dairy or parve meals. The next lunch will be Feb. 4, 11:30 a.m., at Olive Garden at the corner of Hulen and I-20. Please RSVP to Naomi Brand at Ahavath Sholom by Feb. 1 so she can get a head count: naomi.brand@ahavathsholom.org or 817-731-4721. March’s lunch will be at Elaine Stanton’s home with a special guest presenter. Everyone looks forward to meeting you! 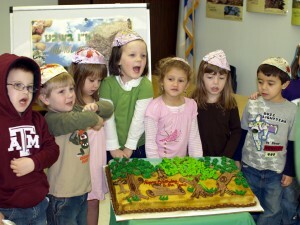 The Jewish Education Agency will honor Naomi and Mark Rosenfield on Saturday, April 30. They will be recognized as this year’s Bubbe and Zayde Honorees for their extraordinary dedication and service to Jewish education for the past 30 years. The Rosenfields will be honored with a cocktail party and Havdallah at Congregation Ahavath Sholom. As in past years, a tribute book, reflecting our community’s gratitude for their service, will be assembled. As an added bonus, the JEA will draw a raffle ticket for “An Evening Atop Fort Worth,” featuring dinner at Reata Restaurant in Sundance Square and accommodations at the Fort Worth Club. Tickets will be sold for $10 each or 12 for $100. All proceeds from the tribute book and raffle will help the JEA’s top priorities, including tuition for Jewish students and the summer campership program. For additional information on purchasing space in the tribute book, raffle tickets or event tickets, please contact Lil Goldman Early Learning Center at 817-737-9898. Seniors: You may be seated! Jewish Family Services extends gratitude to the Annette B. Taylor Senior Citizens fund for providing the means to purchase new chairs for its Senior Program. These vinyl chairs have arms, making it easier for the seniors to get up from sitting. JFS only had a few chairs but as everyone knows, as we age we all need a little more help. JFS is so grateful to be able to provide this for the group. The JFS Senior Program still meets daily at Beth-El so come on and join the great program each day, have a nosh or some lunch and check out the new chairs. JWI, Jewish Women International, will host Dave Lieber, the watchdog investigative journalist for the Fort Worth Star-Telegram, on Wednesday, Feb. 2, at 10:15 a.m. at Beth-El Congregation, 4900 Briarhaven Road, Fort Worth. The subject is how to avoid scamming seniors. Congregation Beth Israel invites all families to a special cooking class featuring Rabbi Charlie Cytron-Walker and Jason Simon. “A Recipe for Family” will be held on two dates; participants may choose either Sunday, Feb. 20, or Sunday, Feb. 27, from 3 to 5 p.m. There is a nominal fee per family member. Coming together to cook a meal creates numerous benefits for everyone in the family. Adding in a Jewish context makes the experience even more meaningful. Attend this cooking class as a family to learn a few new and easy dishes to make cooking and eating together both possible and enjoyable. Strategies for bringing Jewish values to dinner will be shared in an open and fun way, helping families create lasting Jewish memories. Hurry, as space is limited in the cooking school kitchen. Please RSVP by Jan. 15 to CBI at administration@congregationbethisrael.org. Classes will take place at The Dish: Culinary School in the Colleyville Market Street. For more information on the culinary school, please visit www.marketstreetunited.com/dish.asp. “A Recipe for Family” is made possible by support from the Jewish Federation of Fort Worth and Tarrant County. We recently saw some antique Jewish art pieces which were adorned with the signs of the zodiac; this was confusing to us. Do Jews believe in astrology? Do the stars have an effect on our lives and on who we are? If they do, how does that affect our free choice? Sometimes we read the horoscopes in the newspaper and it doesn’t seem very Jewish. Your comments are most welcome. There are numerous references to the influence of the stars in the Torah, Prophets and rabbinic writings. For example, Abraham was known to be an expert astrologer, and read in the stars that he would never have a child, accounting for his barrenness until nearly age 100. G-d took him outside under the stars and said, “Gaze, now, toward the heavens and count the stars if you are able to count them … so shall your offspring be!” (Genesis 15:5) The Talmud and commentaries explain the emphasis on G-d “taking him outside” to the stars, that G-d was telling him “go out” of his astrology. True, the stars say you can’t have children, but I will take you “above the stars,” I will elevate you above their influence, and you will indeed have a son and a nation. This is one of dozens of examples that the stars do, indeed, have an influence on one’s destiny, in this case on his progeny. If not for G-d intervening directly, Abraham would have lived out his life “by the stars,” without anyone to continue his lineage in fathering the Jewish people. We also learn a second lesson from this example, that there is a level of connection to G-d which transcends one above the influence of the stars. This explains an apparent contradiction in rabbinic writings. On one hand the Talmud says that nothing grows or moves in the world without “its star” telling it to do so. On the other hand the rabbis state “Ain Mazal l’Yisrael,” which means that the stars don’t affect the Jewish people. Two answers are offered, both considered true concepts in Judaism. One states that although individual Jews could be affected by the stars, the Jewish people, as a whole, remain above such influence and are subject to G-d’s direct Providence. The second concept is that which we learned from Abraham’s example: Although an individual may be subject to what is written for him in the stars, he can transcend that destiny through actions which unite him to the Al-mighty. It is G-d Who endowed influence to the stars; it is He Who can go beyond them and directly enhance the life of an individual. The question remains: Why would G-d choose to give powers to the stars and not do everything directly? The Kabbalistic writings ascribe the 12 constellations of the zodiac to the 12 tribes of Israel, which coincide with the 12 months of the year (lunar, not Gregorian solar months, hence the inherent flaw with the stuff you might read in the papers). These are the core 12 forms of spiritual energy through which G-d carries out His will in the world. An honorable king does not carry out all his decrees on his own; he has ministers and multiple layers of underlings to execute his bidding. G-d created the world in a way that we can be cognizant of the splendor and majesty of His Kingdom, hence the constellations, the 10 sefirot or upper, spiritual worlds, the angels and layers of ministers carrying out His Will. The most common blessing given by Jews everywhere is “mazel tov.” Literally this means “have a good star.” Mazal means star, and also means “to drip.” The relationship is because G-d “drips” His blessings and bounty into the world through the stars. The blessing to have “a good star” means to have much blessing and goodness flow into the person’s life. Mazel tov! Jan. 1 came and went, and I forgot to talk about the new year. The new year brings resolutions — at least that is what we are supposed to do with the Jan. 1 New Year’s Day. Judaism asks much different things from us at the High Holy Days. So how do we make the secular new year Jewish? Well, resolutions are a pretty good idea if we are realistic. This story is a famous one — this version and the questions come from JCCA’s Mandel Center for Jewish Education. •Why do you think Zusya was worried about not being more like his ancestors? What was it about his ancestors that he wanted to emulate? •Do you think it’s a good thing to want to follow in the footsteps of others? •What do you think G-d meant by the question, “Why weren’t you more like Zusya?” Wasn’t he Zusya? •What happens when you aren’t being yourself? •How can we be our best selves? What might that take? So the question as we begin the new year is: How we can be our best selves? What changes do you want to make and what can you do to make those changes? There are statistics out there that most people do not keep their new year’s resolutions. Why is that, and what can you do to be sure that you will strive to be the best YOU that you can be? It would be a lot easier to resolve to lose 20 pounds (and the J is a great place to do it!) but let’s commit ourselves to more this year! Jews are often known as the “People of the Book,” but Jewish learning doesn’t only have to do with looking at biblical texts — it can include anything from kosher wine tasting to learning conversational Yiddish. The 2011 Dallas Jewish LearningFest starts next week, and community members will have the opportunity to learn in a multitude of ways. The fourth annual LearningFest, presented by the Center for Jewish Education (CJE) of the Jewish Federation of Greater Dallas (JFGD), will take place from Jan. 23 to 30. It will feature more than 50 courses led by local rabbis, teachers and community leaders. The registration fee is $25 per person to attend unlimited sessions; it is $36 after Jan. 17. Courses will begin the morning of Jan. 23 and most will be held at the Aaron Family JCC. The official kickoff event will occur from 7 to 8 that evening when Yuri Foreman, former super welterweight boxing champion of the world, will speak about his journey, being a committed Jew and a boxing champion. Meyer Denn, CJE executive director, said the goal is to provide an array of opportunities so people can find classes that interest them. According to Denn, LearningFest continues to be successful each year because of the quality of the courses and the educators. Generally, 850 people come per week and engage in about 4,500 hours of weekly Jewish learning. The keynote event, “Open ‘Mike’ Night, Two Formidable Mikes on the Mic: Rabbi Michael Lerner and Michael Medved,” will take place at 7:30 p.m. on Wednesday, Jan. 26 at the Eisemann Center, 2351 Performance Drive, Richardson. It will feature a moderated panel discussion with Lerner and Medved, who hold differing political, social and religious views of the Jewish world. A question-and-answer session will follow. Other sessions throughout the week include “Understanding the Source of Anti-Semitism,” led by Roberta Clark, ADL associate regional director; “You are What You Eat — Mind, Body and Soul,” led by Rabbi Sholey Klein, kashrut administrator of Dallas Kosher; “Grandparenting in an Interfaith Family,” led by Jewish Outreach Educator Renee Karp; and much more. Denn added that he believes people will be inspired by the courses. Jaynie Schultz, chair of the CJE advisory committee, said she is most excited about the continued growth of LearningFest and the new format for the keynote event. She believes having a variety of opportunities is beneficial. LearningFest committee member Judie Arkow has participated in this educational event for the past few years and believes it is worthwhile for everyone to attend. She is teaching a session this year, as well, called “Interfaith Marriage — Multicultural Relationships: A How-To Workshop” at 2 p.m. on Tuesday, Jan. 25. She said she has learned much over the years and knows others will be impacted. Fellow committee member Marcia Zidle said LearningFest is important because it unites people from different Jewish backgrounds. She said she looks forward the most to “Open Mike Night” and she enjoys seeing the community learn together to gain Jewish knowledge. For more information or to register, contact Melissa Bernstein at 214-239-7134 or mbernstein@jfgd.org. To register online, visit www.dallasjewishlearningfest.org.